The 2013/14 school year has started, with U.S. educators and their students returning to find much lower budgets available to meet ever-higher aspirations. Three districts shared their stories with us about how Google Apps and Chromebooks help them provide excellent opportunities for students, even in these challenging times. Last year, Huntsville Independent School District struggled with outdated equipment and poor cellular coverage. To address these challenges, they built a wireless network, established free Google Apps accounts for email and word processing, and earned a $100,000 grant, which they used to purchase 350 Chromebooks for grades 6-12. Today over 1,000 students have access to Chromebooks, and high school students even take them home. 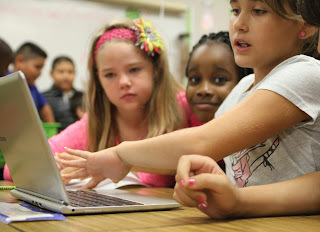 Charlie Baker, a math teacher, explained the value of Chromebooks at home: “Students can send me a snapshot of the screen to illustrate a problem they’re struggling with. I can use Google Hangouts to help them work through to a solution. Student engagement is higher, and the quality of work has improved significantly." Matt Hladun, Director of Technology for the Queensbury Union Free school district in rural New York State, faces a different challenge. Matt lost a number of IT staff to budget cuts. With 2,500 Chromebooks and just three team members, he really appreciates the minimal support that the devices require, saying “it’s hard to argue with increased student motivation, more efficient teaching processes, better communications, and a saving of tens of thousands of dollars a year in software costs. Introducing Google Apps is the most fulfilling thing I’ve ever done. I’m seeing teaching change, and I want it working everywhere. It is absolutely making a difference.” Matt was also able to establish a “Technology Bullpen” of five teachers in each building who help their peers get the best out of the devices and tools.